When you find yourself needing advice who do you turn to? Do you rely solely on others for their wisdom? Do you pick up the phone and call your Mom, brother, friend, boyfriend or girlfriend or spouse? There are times when we find ourselves in need of some sound advice and yet we need to be so careful who we turn to for advice. There are those people who may be promoting their own agenda or may try and manipulate us for their own personal gain. Than again, there are those who wish to help us but they really don’t know what or how God wants to move in our life and may offer us advice that goes contrary to that plan. I am learning that when a thing is important enough to seek advice, before I pick up the phone to call another I need to bring it before God in prayer. Taking the time to ask God to guide me with my decision making should not be done as a last resort. I need to seek Him first and then as He leads, go from there. Too often we look for quick resolutions or pat answers and in many cases neither will bring about the long term results God wants for us in our lives. When we find ourselves having to make a decision about anything or anyone that requires another’s opinion, it should be our first instinct to bring it before God. He is always looking out for our best long term interests. His advice will never lead us astray or down the wrong path. Sadly, friends may come and go. Family, though it may believe it, may not always know what is best for us in our walk with Christ. We need to depend on and trust in the lover of our soul, Jesus. Ultimately we will one day stand before Christ and either hear, “Well done thou good and faithful servant,” (Matthew 25:21) or “Depart from me for I never knew you.” (Matthew 7:23). The choices we make, here on earth, will determine which response we will hear. Regardless of what another tells us, we are ultimately responsible to Christ for working out our own salvation and therefore we have to be very careful who we turn to for advice. The next time you are unsure about a decision, take the time to ask God to provide the wisdom to make the right choice. There will be times you may have to wait on an answer for a time, but seek Him first. He will never lead us astray! Psalm 146:3-5 NIV 3 Do not put your trust in princes, in human beings, who cannot save.4 When their spirit departs, they return to the ground; on that very day their plans come to nothing. 5 Blessed are those whose help is the God of Jacob, whose hope is in the Lord their God. 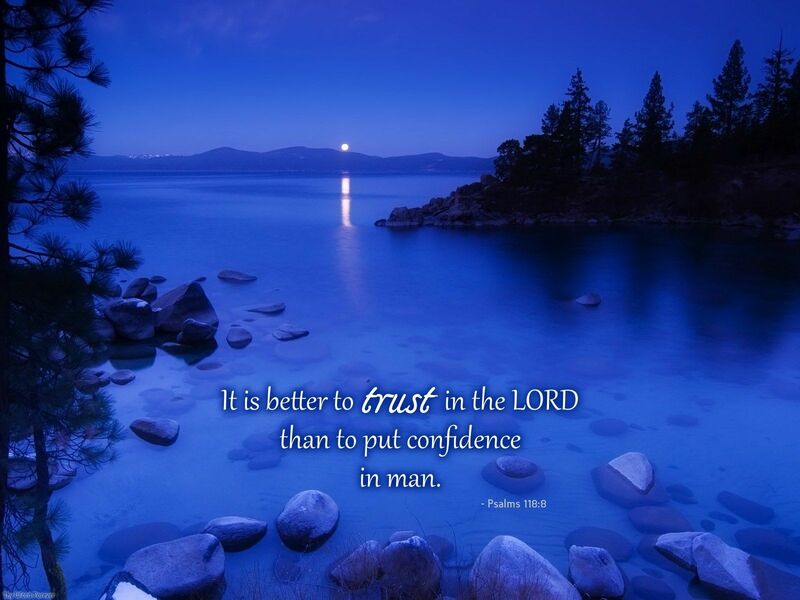 Proverbs 3:5 NIV 5 Trust in the Lord with all your heart and lean not on your own understanding. ← Learn the promises you can stand on! Very true. Seeking the Lord for a solution should be first!. God bless.